A bridal shower should be all about fun, excitement and laughter and to help you with that, I have made all these free printable Bridal Shower Game including this Wedding A-Z Game. This is another fun game that bride-to-be and guests will enjoy playing on Bridal Shower Party. How to Play: Distribute the printed game cards among you party guests along with a pen. 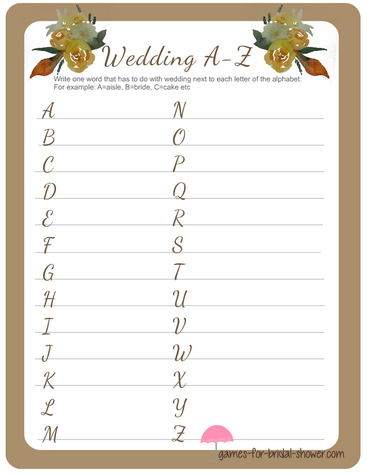 Ask the guests to write a wedding related word in from of each alphabet with in 5 or 10 minutes. You can assign the time according to your own party plan. The guest who has made the most relevant words within the assigned time will get the prize. Click on the image shared above to get the printable version of this game in brown color. The brown color will match any theme that you have planned for your Bridal Shower. This is another free printable version of Bridal Shower A-Z game that you can print using your home computer for a very economical yet fun Bridal Shower Party. This game is in Purple color and you can print this according to the number of your Bridal Shower party guests if it matches your theme. These Bridal Shower Game Cards are in Pink color and these will be loved by all your party guests.